Trust is such a simple concept and yet one which is constantly misapplied in our world and even our own lives. How often have we heard the words, “I got this. Trust me!” from different people and in different circumstances? But in how many of those promises can we actually place our trust? In Episode Seven of Stranger Things, “The Bathtub,” the issue of trustworthiness (or lack thereof) runs as a consistent theme throughout, and it is worthwhile to consider the differences between the trustworthy and untrustworthy characters presented. To begin with, we discover Dustin, El and Mike struggling to hear Lucas’ voice over a CB radio. Seeing a Hawkins van parked outside their home, Mike rushes upstairs to speak to his mom (who is on the phone). She brushes him off (although he doesn’t explain himself well), Dustin interrupts with a “We have to go – NOW!” and the kids jump on bikes shouting, “Go, Go, Go!” as several more Hawkins vans pull into sight. As a parent, I was struck by the fact that Mike’s mom didn’t tune-in to his need for her at that moment, in spite of being on the phone. Moms know the difference between real need and needless interruptions. It was obvious that Mike didn’t really trust his mom enough to fill her in on critical information, let alone seek her help, and simply rode away on his bicycle. It was a breakdown of communication and relationship because of a lack of trust – Mike didn’t believe in his mom as his ally. [stammering] Did, did you see what she did to that van? No, Dustin, we missed it. Awesome. It was awesome. (*Note: this is the first time Lucas has addressed an act done by El in a positive light – he then turns and speaks directly to her.) Everything I said about you being a traitor and stuff – I was wrong. I’m sorry. Friends – friends don’t lie. I’m sorry, too. Theme music begins to play leaving the audience on a happy note that trust and friendship have been restored. Next, we turn to the police station where Jonathan is in handcuffs. Joyce has arrived with Hopper and is demanding that the cuffs be removed. The contents of Jonathan’s trunk are revealed (including bear traps, gasoline, and other suspicious weaponry). Hopper turns to Jonathan, demanding to see him in his office. Jonathan’s skepticism is immediately tested when he replies, “You won’t believe me.” But Hopper has had weird experiences too, and responds, “Why don’t you give me a try?” The audience doesn’t even see the reconciliation that happens next, but later on we discover that Jonathan, Nancy, Joyce and Hop are working as a team to find Will. Interesting. A situation (in jail), which would often result in a negative outcome between teen and adult, yet Hop is someone Jonathan and the others, can place their trust in. He’s on their side. And Jonathan also demonstrates trustworthiness in his story. We jump back to the Wheeler residence where Brenner (Modine) and his crew are questioning Mike’s parents. You think my son is hiding this girl? What happened to her hair? We just need to know if you’ve seen her in the past week. No, no. Absolutely not. Our son with a girl? [chuckles] I mean, believe me, if he had a girl sleeping in this house, we’d know about it. Wouldn’t we? (turning to his wife, Karen, who lets out a sigh). You come into my house, and you tell me that my son is hiding some girl, and that he’s in danger, but you can’t tell us why? And you, what, you expect me to remain, what, calm? I understand how upsetting this is. I wish we could tell you more but I can tell you that your son, Michael, is in real danger. We want to help him. We will help him. I give you my word. But in order for me to do that you have to trust me. Will you trust me? (Karen reluctantly nods). Good. 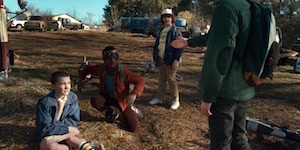 Brenner’s use of the word “trust” has been used throughout the entire season of Stranger Things. And one thing the audience has known (and El is discovering) is that his words mean the exact opposite. Brenner is only concerned about two things – power and control – he has no real love for El or genuine concern for Mike and his friends. As Karen nods her reluctant “yes,” the audience cringes because she is trusting in deceptive words. Yet, our society does this all the time, and our kids will too if we don’t teach them discernment and real trust in the Lord. In the next scene, we begin to see a slight character shift (perhaps in the direction of real trustworthiness) in Steve. He and his friends are together, and Steve criticizes them for being so mean to Nancy (spray-painting obscenities about her in the previous episode). Steve’s own hypocrisy is brought into question, because he was participating too, but Steve seems to honestly be changing and regretting his own past bad behavior with Nancy. He tells his friends, “She actually cares about other people.” The scene climaxes in a near fist fight. The audience realizes how tenuous a friendship Steve and his “friends” really have, and what little trust exists between them. A rushed series of events take place. Hopper knows where the gate is and says he is going to go get Will. Jonathan wants to go to, but Hopper responds, “Listen to me. I’m gonna find him. All right? You gotta trust me on this. I am going to find him.” Jonathan doesn’t argue – Hopper is a trustworthy guy. Needing El’s intense telepathic powers, a saltwater “bathtub” is created with more than 1500 pounds of de-icing salt stolen from the highschool. Joyce reveals herself as a trustworthy mother figure to El. You’re a very brave girl. You know that, don’t you? Everything you’re doing for my boy, for Will, for my family. Thank you. Listen. I am gonna be there with you the whole time. And if it ever gets too scary in that place, you just let me know, okay? I could continue presenting verses on trust for pages more because the Bible is literally packed full of them. The main difference between the trust discussed in the Bible and that tossed around in Stranger Things is this – God can be trusted with everything, always and forever. He will never let us down. How have you ever put your trust in someone or something that let you down? In what ways have you ever promised something to someone else and fallen through on your promise? Do you consider yourself a trustworthy person? Why or why not? What about your friends? Can you trust them? Why or why not? What character qualities do trustworthy people have? What about untrustworthy people? Why do you think Mike and Nancy don’t trust their parents? Can you trust your parents? Why or why not? Joyce has had mental problems and Hopper has had addiction issues. What makes them trustworthy? Are they completely trustworthy? Why or why not? What do you think about Steve? Does he truly feel badly for his behavior? Do you trust him? Why or why not? How is trusting in God different than trusting in people? If human beings are still sinful, can we fully be trusted? Why or why not? Should we still try to be trustworthy? Why or why not?